This is the battle that JDM fanatics will be talking about for years; GT-R vs GT-R! Can the older R34 hold its own against the brand new R35? The new Skyline GT-R35 has been the talk of the automotive industry after unofficial videos showed up on Youtube of the car killing it on the Nürburgring beating the more expensive Porsche 911 Turbo lap time by 2 seconds. Cobb Tuning bought this RHD (right hand drive) GT-R straight from Japan and have been developing various parts for this car including their AccessPORT ECU tuning tool. The team has been shaking down the car at a number of track events and we are excited to finally see this car in competition. 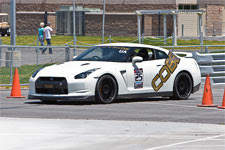 The Focus Auto Sales GT-R is well built and pushing 588whp. Is this horsepower advantage enough to counter the technology advancements found in the new generation of GT-R's?